Wind helps create jobs and has an annual economic impact of around $20 billion on the economy, according to the U.S. Department of Energy. So, it’s no surprise wind farm construction has increased nationwide year over year, according to the American Wind Energy Association. Farmland is ideal for construction sites but tends to be isolated from city amenities. Companies must be self-sufficient and plan ahead to maintain efficiency. This includes setting up temporary storage warehouses to facilitate progress. A global renewable energy company embarking on a new wind farm construction project needed to set up a temporary warehouse for supplies and equipment. They’d developed and constructed wind farms in other states using temporary warehouse structures for storage, and it had worked well for them. They needed a vendor who could offer turnkey service and expertise in the industry. They called Mahaffey. 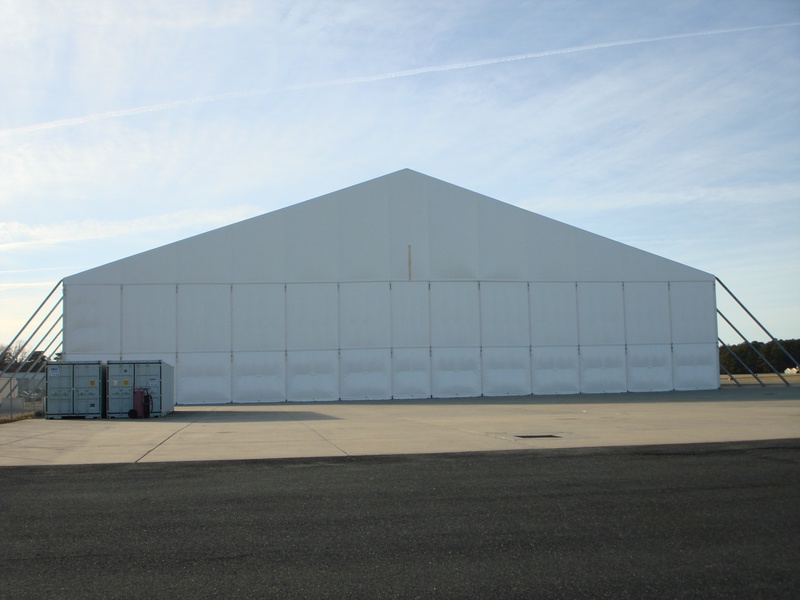 Our team had installed temporary structures on other projects for them and were awarded the wind farm warehouse based on successful outcomes in the past. The challenge for the energy company was maintaining their preplanned schedule. Construction projects are planned well in advance, and each step is mapped out to bring the project to completion on time and on budget. The company needed the warehouse on site before construction began, and it needed to remain on site for five months. The company requested that the engineered structure include personnel doors and overhead doors large enough to allow equipment to pass through. Mahaffey considered the project specifications and the location of the project. The wind load code for the area was focused on wind gusts and did not mention sustained winds as a concern. However, our team had experience in the region and knew that sustained winds were the real culprit behind damage to temporary structures in the area. Mahaffey’s MegaStructure™ was ideal for this project. The MegaStructure™ is made of industrial fabric, is engineered to withstand winds up to 130 mph and is ideal for semi-permanent applications. It was an excellent choice for the wind farm construction site. The final proposal included MegaStructure™ on 16-foot legs, with roll-up doors, personnel doors, an LED lighting package, and Mahaffey’s expert installation team. The Mahaffey installation team arrived on site at the appointed time to begin work. Unforeseen challenges with rainy weather and equipment failure made it impossible for the construction site employees to prepare the ground for the installation of the MegaStructure™. The Mahaffey team remained flexible and undeterred. When the weather cleared, the construction team prepared the site for installation, and our team moved ahead with the process. The structure was installed on site in seven days, allowing plenty of time for construction work to begin on the wind farm as scheduled. Mahaffey’s ability to stay on point and handle the task at hand is well-known in the industry. We finished the project on time in spite of delays, and our customer was pleased with the result. When you have a big project to do, it’s important to team up with a vendor that looks at the job from every possible angle to make the best recommendation for you. Mahaffey has years of expertise setting up structures in every region across the United States. 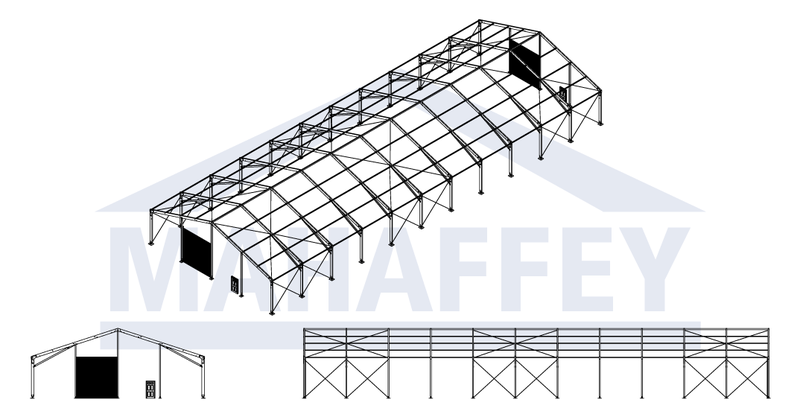 Mahaffey is more than a structure vendor—we are a true partner in your next project. Ready to work with us? Contact one of our project managers today.